Going off of a tip from a book about offbeat Minnesota attractions, we made our way up to the “Reverse Road” outside of Finland, MN which is a tiny little town on Highway 1; the windy, curvy road that connects Ely to Highway 61 along the North Shore. 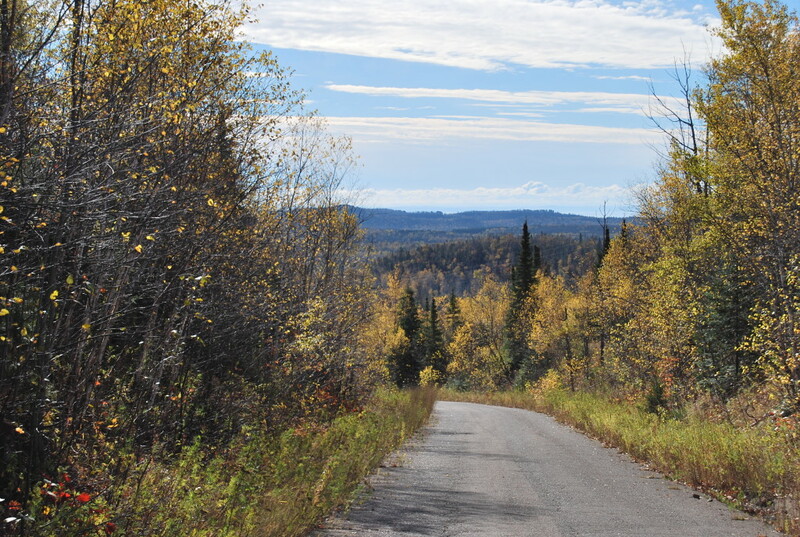 It’s a beautiful area, nestled in between the Boundary Waters/Iron Range and the dramatic shoreline of Lake Superior, right in the Sawtooth Mountains. The book talks about a road outside of town which climbs up some elevation to an old abandoned airbase, where a locked gate advises No Trespassing. Supposedly, you drive to the top, and as you make your way back down the crests that lead up behind you, put the car and park, and the car starts rolling uphill. 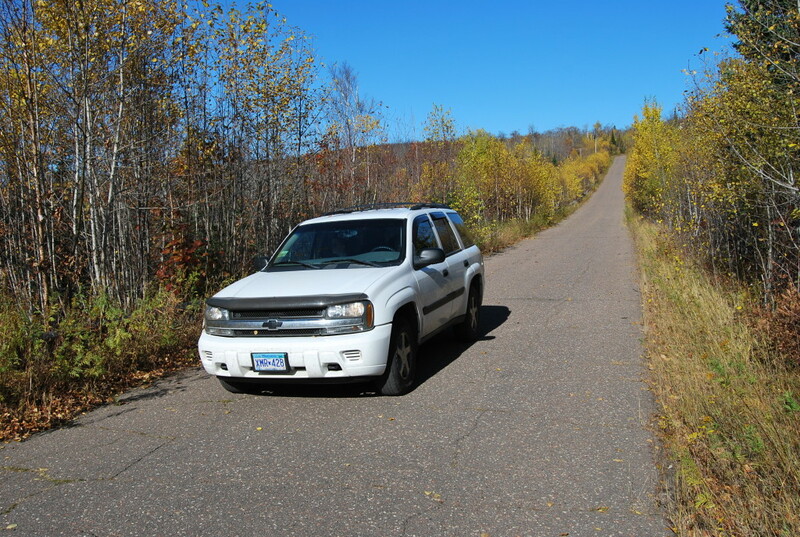 We located the road, called “Airbase Road,” (above) and began our journey up. 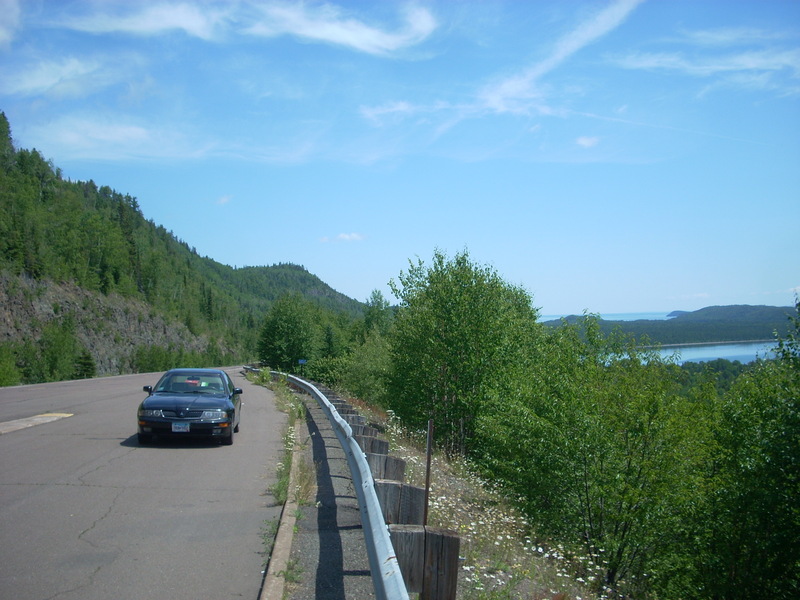 Once we reached the gate at the top, we turned around and first enjoyed the beautiful view looking back down out towards Lake Superior. Following the book’s instructions, we made our way back down to one of the spots that level off and put the car in neutral. Then, supposedly, you wait for a bit and slowly your car will start rolling uphill. There is nothing whatsoever around the area that indicates the Reverse Road. There is no marker that tells you what direction to face, where to stop, or anything out of the ordinary anywhere on the road or in the town. Which certainly draws a bit of skepticism, rightfully so. Well we waited for awhile, and nothing happened. We backed up and tried another level spot. Nothing. Drove down the hill again and still were unable to feel anything. 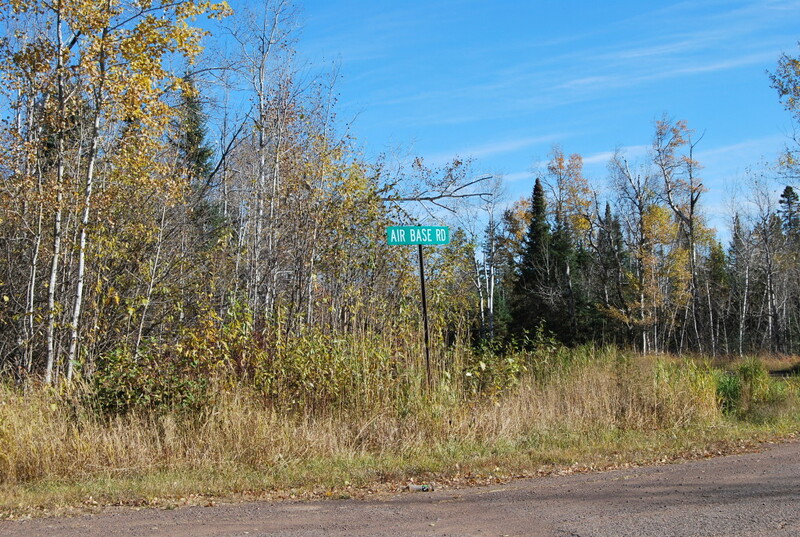 There was no one around on the beautiful autumn afternoon to ask, and eventually, we gave up and headed back down to Highway 61, disappointed. Is it just a hoax? An optical illusion? Maybe you will have better luck on the Reverse Road than we did. It was still a fun experience; the view is incredible and the area is peaceful and quiet. And there is certainly an intrigue to what’s beyond the locked gates at the top. Have you been to the Reverse Road? We’d love to hear from you if the experience worked! While in the area: Finland is home to a great wood-carved statue of the fictitious St. Urho, and only a few miles from hidden gem Illgen Falls Cabin. But if you’re up on the North Shore, you’ll have plenty to do anyways. Just went up the reverse road. We were skeptical but tried a spot by the old quarry and put the car in neutral and we slowly crept UPHILL! Very cool! I bet that was amazing! We tried this today and got it to work! Go to the airbase gate and then turn around. After a half mile or so, you’ll enter a place that’s like a bowl – a hill on one side with a dip in the center and a hill leading up out of the “bowl”. If you’re facing east (away from the airbase gate) and in the bottom of the bowl, put your car in neutral. It will roll up the second hill. We couldn’t get it to crest the hill, but we went halfway up at a pretty good speed and then the car stopped. It’s possible that if we’d stopped further back, we could’ve gained enough momentum for getting up the hill. Went here today and it totally worked. Stopped st the bottom of the hill, put it on neutral, coated uphill.